Former Alaska Governor Sarah Palin gave a 40-minute speech to a crowd of about 2000, gathered in an outdoor field this afternoon near Indianola, Iowa. She blasted the country’s “permanent political class” and “crony capitalism” and warned folks to question presidential candidates of her own political party. But while Palin spent some time outlining her own economic plan — and the crowd chanted “Run, Sarah, Run” at one point during her address — Palin did not use the occasion to announce a 2012 candidacy of her own. Charlie Grushow, one of the founders of the Tea Party of America, is the main organizer of today’s rally in Indianola which will be capped by a speech from former Alaska Governor Sarah Palin. The outdoor venue for today’s Tea Party of America rally is currently under a thunder cloud. Rain is pouring onto the field and onto the people who are sitting in lawn chairs or standing on the field. This pasture is used as a hot air balloon launching pad during annual Indianola’s balloon festival. Today would be a no-launch day were the festival still on. It’s difficult to talk with the folks who are in the crowd, as many are huddle under their umbrellas. The program has begun, however, and the Pledge has been said and the National Anthem was just sung. There is a press tent at the event, which I’m huddled under along with colleagues who are typing on their laptops. I’ve taken a few pictures, and offered up a spare umbrella for sale (it’s in my car trunk), on Twitter. According to the program schedule, the folks outside have another hour and a half to wait before Palin takes the stage. See the headline above for the latest information from a source close to former Alaska Governor Sarah Palin, about Palin’s appearance at a “Tea Party of America” event on Saturday in Iowa. Here’s your background if you’re just tuning in. 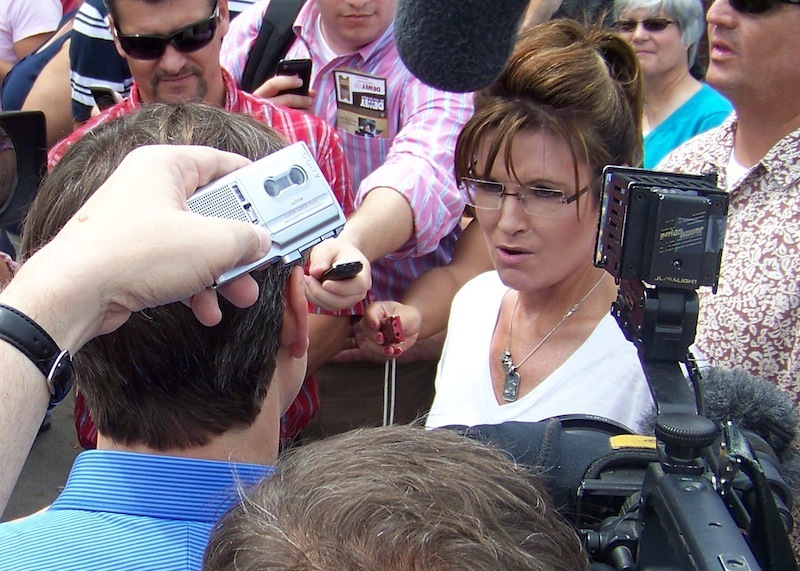 Palin’s Iowa appearance on Saturday? Former Alaska Governor Sarah Palin is/was to be the headliner for a Saturday rally in Indianola, but a Palin insider tells me the Palin camp now is “not sure” that Palin will indeed attend. Palin had accepted an invitation from a group called “Tea Party of America” to appear at their event in central Iowa over the Labor Day weekend. That group was formed last year by Charlie Gruschow, former leader of the Des Moines Tea Party. Earlier this year Gruschow endorsed Herman Cain’s presidential bid, but Gruschow left the Cain campaign in July and he’s been among the planners of this Saturday’s event at the balloon field in Indianola. Someone cited by The Wall Street Journal as a “person close” to Palin says the Palin camp is upset by the “continual lying” of “Tea Party of America” organizers. Over the past couple of days, there’s been confusion about another Republican, Christine O’Donnell, and whether she would speak at Saturday’s event. As another source told me, that “seat of the pants” kind of event management has prompted the Palin folks to reevaluate. As of 12:30 p.m. on August 31, 2011, the Palin folks have not cancelled on the Indianola rally, but the appearance is in doubt. “Not sure yet” is what one source close to the Palins tells me. I talked with Secretary of State Matt Schultz this afternoon. He confirmed there were write-in votes counted in Texas Governor Rick Perry’s tally that did not spell the Texan’s name correctly. It got spelled “Parry” — as Stephen Colbert suggested . It got spelled “Pery”, too. Sarah “Paylin” got a vote, according to Schultz. But most of the 218 “scattered” votes on Saturday were write-in votes for fictional characters — the State Fair’s Butter Cow topped the list. Oh, and there was at least one write-in vote for a Barack Obama. Read more here. I had a conversation this afternoon with Stephen Bannon, the writer and director of “The Undefeated” — a documentary about former Alaska Governor Sarah Palin. The film will premiere this coming Tuesday, June 28 at the Pella Opera House. I followed up with this question: When you see filmgoers leaving the Pella Opera House, what are you hoping? That they’re inspired to vote for her? What’s the goal of the film?